A cute 1 bedroom condo 1/10th of a mile from Glendon and Hagis Beach. Inground pool. Walking distance to restaurants and close to Sunday School Ice Cream. Lots to do in the area. Condo has 1 bedroom, living room with sleep sofa, 1 bath, outdoor patio setup with a grill. Sleeps 2- 4 people. Fully equiped kitchen. 1 parking space. Dennis has 17 beaches, historic areas, as well as the cape cod rail trail for bikers. The unit is depressing in the way that old, dilapidated, cheap, and dirty furnishings are. As soon as you walk in, you're hit with the smell of mold, perhaps years worth of animal vistors or proximity to the ocean. The bed was soft--very uncomfortable to sleep in--and smaller than described. The back yard is a tiny, filthy patio. We found the place so dispiriting that we left a day early. So sorry your stay was disappointing. I have never had this kind of response. I did take the opportunity to look more carefully at the furnishings and freshen them up with new pieces but overall the mattress and furniture is new. This is only the second summer it has been used. I have only had 1 pet stay there and that pet was crated. The back yard had pine needles from the tree above but has a nice shaded outdoor space with a table and chair set, a grill and a patio carpet which might need to be swept if there are pine needles, we did trim back the trees that overhang. I know your weekend was rainy and that can cause dampness and that I do not have WIFI which you thought was available. I spoke to you several times over the weekend and you never expressed the above stated concerns. I sincerely apologize if it was not to your liking. Overall, the property offers a nice proximity to the beaches, restaurants and offers a pool. It is a nice value. I have had several people inspect the property since I adjusted the furniture and trimmed the trees; all felt the property was in great shape. I take pride in offering a nice condo with many repeat customers, and while I think your review was extremely harsh, It did allow me to look at the property with a discerning eye and make adjustments. When we arrived, the house was smelly and not very clean. We found cutlery that still had food on it. Also, the front door was very tight from the humidity. Luckily, the owner had informed us beforehand, but we still had a hard time opening the door. Also, we did not manage to completely close and lock the door during our first night. The information provided beforehand said that queen size bed linen would work, but the bed is actually smaller than queen size. 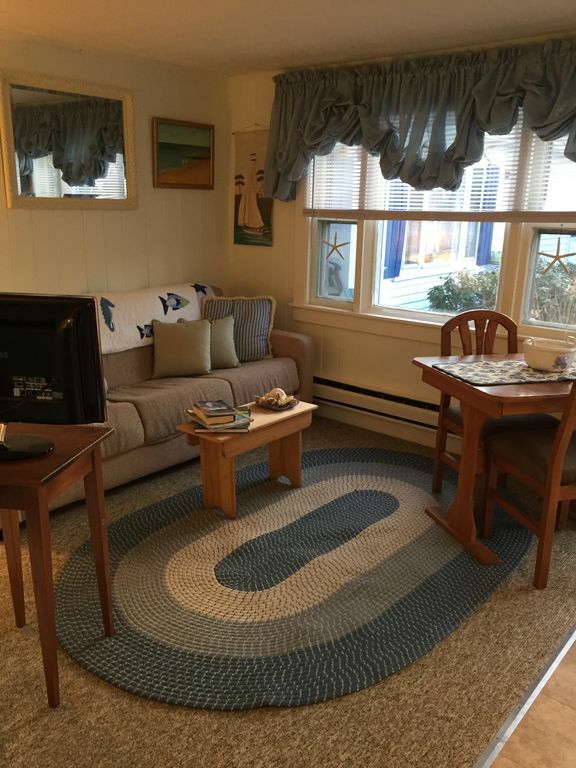 My wife and I had a great week staying in Dennis Port and the studio location couldn't have been better. It had all the essentials and the owners were very responsive with any questions we had. The beach couldn't have been more than a quarter mile down the road and all the neighbors and locals were super friendly. We can't wait to get back to the cape. The location couldn't be better, less than a five minute walk from the beach. The space was perfect for my boyfriend and I. I wouldn't recommend staying here with more than 3 people. The kitchen was well equipped! Overall a little dingy but a steal for the price and location! Great location. The perfect size for a few ppl and a pup. Close to all the fun!